Since the 60s the 70-20-10 Model for Learning Development has been a popular model in education innovation. The 70-20-10 concepts is that that people learn 70% from experience, 20% from social learning and 10% from formal learning. So, where does e-Learning fit in? And should the 70-20-10 model be changed? While e-Learning would technically fall into this category I just can’t accept that it is formal learning in the sense that Morgan McCall and his colleagues were referring to. Good e-Learning is far more effective than old-school training methods. By old-school I some old guy standing there with a text book in one hand and a cane in the other. Good e-Learning engages the learner, is interactive and can be fun. It is far from what I would call formal learning. Classroom based training has evolved a huge amount since the 60s as well. As an employee at a training company I have the great opportunity to go on training courses whenever I can get time. This means I have actually had more formal training this year than any other. I would say I picked up a huge amount from my last training course. This was mostly down the trainer who knew how to keep me interested and on my toes. I think the improvements in classroom training alone means formal training can easily keep hold of its 10%. Social learning is learning from other people. Humans are social creatures that have evolved to learn from others. Social learning is how we all learnt to walk, talk and interact with the world when we were young and that ability to learn from others just doesn’t disappear. Social learning in the workplace can take many forms. The most effective is feedback. There is not a single day where I don’t ask one of my colleagues how they would approach this and I’m sure they are sick of it. Each time I take their advice and learn from it. The same goes for when I deliver a first draft of a project to a client. I get excited because I want to know what they think needs to be improved. When you start to add forums and social media as learning tools it’s hard to see how social learning only accounts for 20%. Everybody learns from their mistakes and you can’t make mistakes unless you do something first. That is the basic principle of learning from experience, and nothing is more true. Physically doing something makes you better at it. If you take using a new piece of software as an example, however many YouTube tutorials you watch, samples you see or demos you make. Nothing beats working on a project for real. The more you use it the more you experiment and try to push the boundaries. Then things break. Nobody else is in the office. So you order a pizza and start bug fixing. There is no better way to learn than trying to fix your own mistakes. Honestly, most days I learn 99% from experience, so I can’t take away from the 70%. If you hadn’t noticed, I agree with 70-20-10 model, and it still adds up to 100%. 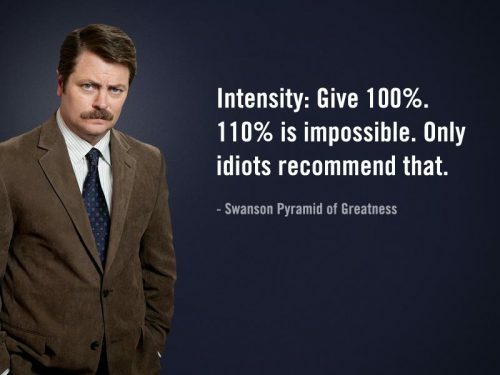 Don’t worry, I’m not going to say learners should give 110%. Ron Swanson shares my opinion of that phrase. I am, however, not going to pigeon hole e-Learning into one of the three categories or take anything away from them. We should instead concentrate on applying the 70-20-10 model when developing courses. 10% of our courses should be the more formal fact giving and explaining principles. 70% of our courses should be scenarios, interactions and testing. This should be accompanied by 20% feedback. This can be in the form of instant on screen feedback, social media or emails to fill in any gaps. This allows us to leave e-Learning as a free spirt and, I’m sure Morgan McCall will agree, that’s what the 60s were all about.